The organizational structure of the SNI was set out in a new governance framework in 2015. The Argovia Committee acts as the supreme governing body. The key decision-making body in the SNI, with leadership responsibility for the organization, is the SNI Board of Directors. It ensures that there is good communication with network partners, determines funding allocations and is accountable to the Argovia Committee for expenditure. 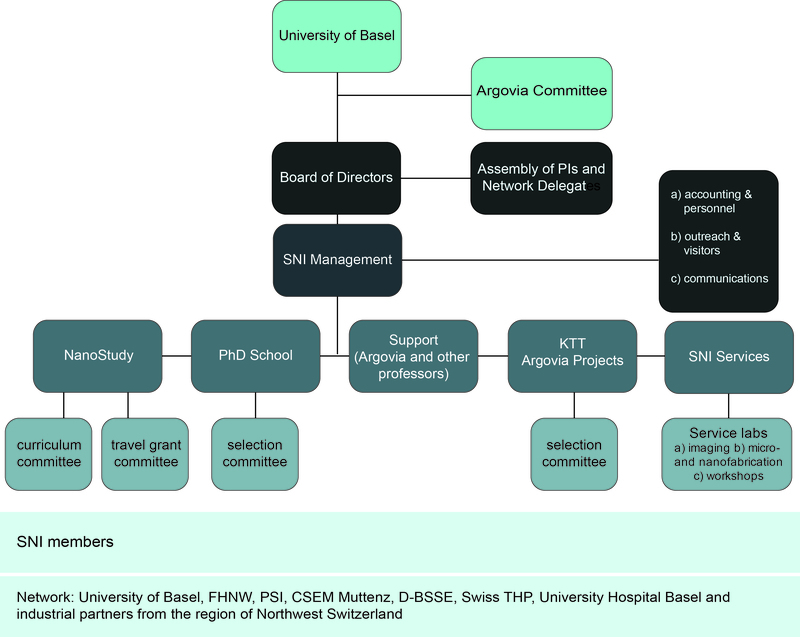 The SNI Board of Directors is also responsible for ensuring that university guidelines and contractual agreements with the canton of Aargau are adhered to. Day-to-day business is handled by the SNI Management Team. As well as dealing with HR, finances, communication, degree programs and the PhD school, the management team is responsible for the annual conference, where all members of the SNI meet to exchange scientific ideas. The Project Heads and Delegates Meeting exists to encourage scientific discussion within the SNI and to monitor scientific progress. Issues relating to the nanoscience programs at BSc and Masters level are dealt with by the Teaching Commission. There is a further committee for doctoral students at the SNI’s PhD school. Members of the Argovia Project Selection Committee evaluate projects submitted to the Nano Argovia program once a year and make funding recommendations to the SNI Board. The Selection Committee’s members are appointed by the Board, based on suggestions from participating groups. To ensure maximum co-ordination with other local and national funding programs, the Committee’s members include at least one expert assessor from the Aargau Research Council, the Hightech Zentrum Aargau and the CTI respectively. In 2014, the SNI introduced a membership scheme to define clearly who is included in the SNI research network. Under this scheme, all project leaders and co-leaders of Argovia projects and projects in the SNI’s PhD school are automatically members of the SNI. All SNI PhD students and members of the SNI management team are also part of the SNI. Scientists active in the field of nanosciences may apply for membership, even if they are not working on an SNI project. All members may participate free of charge in SNI events like the annual conference, make use of SNI services, and take advantage of the benefits more generally of belonging to this diverse network.